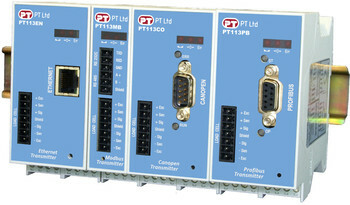 The PT113 digital transmitter family is designed for static or dynamic weighing, force and pressure measurement processes to provide fast and accurate digital data through RS-232C, RS-485, Ethernet TCP/IP and fieldbus systems such as PROFIBUS, Modbus TCP, Modbus RTU, PROFINET and CANopen. Weighing functions such as Zeroing, Taring, Power-On zero, Net indication at power on, Motion detection, etc. are integrated into PT113 transmitters. The PT113 has configurable vibration suppressing digital filter settings, calibration with a calibration weight or by electronic calibration without calibration weights (dCal ) via PT AzCom software. DIN rail type enclosures provide easy mounting in control cabinets. Data sheet for PT113 digital strain gauge transmitters. Notes regarding configuration of the Azure Series instruments with AzCom software and fieldbus communication.